When we think of the great liners of the world, there is a tendency to think British. QE2, Queen Mary, Titanic and Great Eastern have all taken centre stage in some great historic maritime event. Britannia rules the waves, indeed. But while researching another story, I was reminded that the Germans have a lot more nautical heritage than just the Bismarck and U-Boats. The voluminous Hamburg Passenger Lists read like a Doomsday Book, containing the names and final destinations of over five million migrants who dispersed to the USA and Australia -including this writer’s descendents – on a vast fleet of vessels. Beside their preoccupation with fastidious records (which miraculously survived WWII) the Germans were a major force in the rapid development of luxury ocean-going passenger vessels. The Hamburg-Amerikanische Packetfahrt-Actien- Gesellschaft (Hapag) began in the mid-19 th century and drew criticism from rivals for luring business with lavish facilities aboard their fleet of passenger-focussed ‘packet’ vessels. 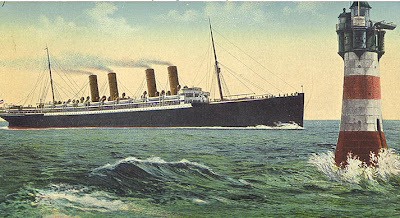 By the beginning of the 20th century, the proud and competitive Germans were producing class-leading ocean liners such as the SS Kaiser Wilhelm der Grosse, SS Kronprinz Wilhelm (pic above) and SS Deutschland which regularly competed for the grand prize of ocean liners, The Blue Riband. Awarded for the fastest westbound crossing of the Atlantic, the Germans dominated with crossings of just five and a half days. The fine-living Germans are widely credited with producing the first vessel dedicated to the hedonistic pleasure of cruising, the exquisite Prinzessin Victoria Luise (above). Styled more like a private yacht, she was fitted out in a style befitting royalty and included a library, gymnasium and photographic darkroom. In fact the Kaiser himself was mildly displeased after inspecting the vessel as it rivaled his own yacht for luxurious appointments. The Princess’s career was sadly short and she ran on rocks near Kingston in late 1906. The devastated captain shot himself. By the 1920s, these great ships were either lost or scrapped, making way for a new wave of German liners. In 1928, the Norddeutscher Lloyd line (NDL) launched two state-of-the-art vessels, Bremen and Europa, both capturing the Blue Riband on their respective maiden voyages. Cruising and zeppelin flights to South America were very popular for the Germans prior to World War II and in the mid- and late 1920s, the Hamburg Sud commissioned the Monte class vessels, noteworthy because they were ‘classless’ in their passenger configuration. Cost of the cabin depended on its size and location. One, the Monte Cervantes, was used for adventure cruising. It struck an iceberg near Spitsbergen, was repaired, then struck rocks near Ushuaia and ultimately sunk in January 1930. The single life lost was again that of the captain. The great German ships of the 1930s were tainted with Nazi propaganda, but still retained impressive style and proportions. Ships were launched as pleasure vessels for German workers. One, the 25,000 ton Wilhelm Gustloff would feature in the single greatest loss of life ever in a maritime disaster when she was torpedoed carrying 10,000 refugees in January 1945. 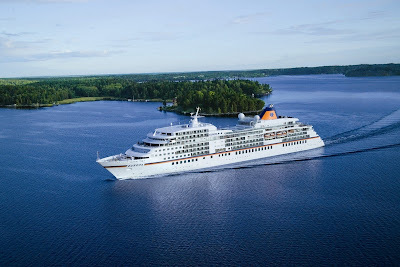 Today, the pride of German cruising is on display with the consistently top-rated vessels of the Hapag-Lloyd line; Europa, Bremen, Hanseatic and Columbus, names which are anything but co-incidental.